You can finally treat yourself to made in America three-layer pots and pans at approachable prices. 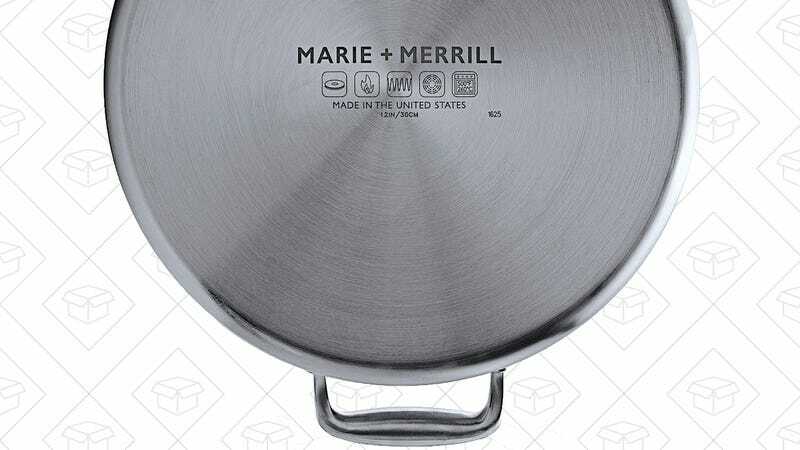 Marie + Merrill pans start at just $55 for an 8" skillet on Kickstarter (estimated retail $60). Every piece of Marie + Merrill is made with three metals layered all the way up the sides of each vessel. The outer layer is magnetic stainless steel, the middle is aluminum, and the cooking surface is 18/10 stainless steel. We use the magnetic layer so it’s induction-ready, the aluminum core for its thermal properties, and 18/10 because it’s the most sanitary cooking surface and non-reactive with all foods. The result is one continuous piece which heats evenly and looks beautiful. I’m no chef, but I’ve been using several pieces of Marie + Merrill cookware for the past few weeks, alongside cast iron, copper, All-Clad, non-stick, and something new called Hex-Clad we’ll be talking about soon. And I’m very impressed. The Marie + Merrill pots and pans look great, are lightweight, easy to cook on, and easy to clean (definitely had problems with this in the past with stainless steel). In addition to being induction-ready, these pans are also dishwasher safe, rated oven safe to 500 degrees, and non-stick options are available. We’re all about innovation around here, but Marie + Merrill wins with simplification, and so will your wallet. Update: Kenji from The Food Lab has taken to Twitter to allege Marie + Merrill pots and pans are a rebrand of an existing line of products, but evidence for or a source of this information has not been provided. We’ll update if/when we learn more. Update 2: Kenji emailed to affirm his statements on Twitter. Our contacts at Marie + Merrill later emailed me offering to discuss Kenji’s statements. When I said I’d be happy to discuss but that the conversation would have to be on the record, I did not receive a response.